Description... Since his brother’s death, Benny Bianchi has been nursing his grudge against the woman he thinks led to his brother’s downfall. He does this to bury the feelings he has for Francesca Concetti, his brother’s girl. But when Frankie takes a bullet while on the run with Benny’s cousin’s woman, Benny has to face those feelings. I have to thank my fellow escapism reading friends on Goodreads who introduced me to the world of Kristen Ashley’s stories. If I could hug you, I would, and some of you I have. Thank you, thank you, and thank you! From the bottom of my heart... I can't imagine not having the beauty of Kristen Ashley's stories in my life. If you’re like me and live love to read, and you wake up in the morning looking forward to the stolen moments throughout the day you’ll be able to get lost in a story, you know exactly what I mean when I say that when you’re in a reading slump, it’s almost painful to get out of bed some days. Do. Not. Judge me - yes, I said painful – and sadly, that’s where I’ve often found myself lately. 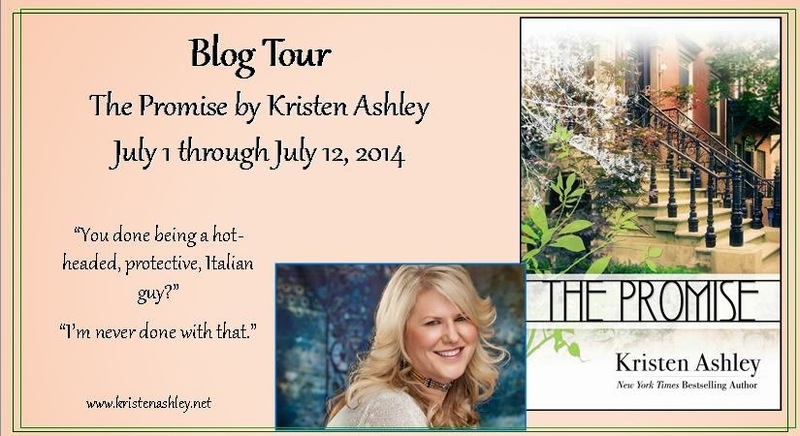 So when I heard my iPad ‘ding’ with a ‘you’ve got mail’ notification and I saw that my blog had been approved for an ARC of The Promise, I nearly wept with joy because reading a Kristen Ashley story is one of the most exciting, comforting, beautiful things I can think of. And The Promise has given me exactly that. Excitement, comfort, and beauty. Start to finish, first word to the last, I fell in love with Frankie and Benny. They are people I can relate to, people I can cheer for, and yeah... people I can fall in love with. An added benefit, as if any Kristen Ashley book needs something more to make it shine, spending time with Joe, Vi, and the girls... the icing on top of the icing on this already scrumptious cake! Blithely Bookish Reviews was given an eARC of The Promise, and in return I'm giving the author an honest review... honestly, it is wonderful!